Work zones by nature present transitions and changes to motorists’ expectations. Given these conditions, providing proper guidance to motorists is critical. With respect to pavement markings, the challenge is to provide sufficient markings but in a temporary setting. Various pavement-marking products are currently in use within work zones; however, their effectiveness and cost can vary widely. This research evaluated the effectiveness of several common removable pavement marking products in terms of daytime presence, retroreflectivity, and removability. The evaluation was completed on an active work zone in central Iowa and included both white and yellow edge-line markings within the taper and crossover sections of a work zone. Presence was evaluated in terms of the amount of product remaining at the end of the evaluation period. Retroreflectivity was measured using a 30 meter geometry retroreflectometer. Product removal was evaluated in terms of internal tape strength, adhesive bond, and the amount of discernible markings after removal based on the American Association of State Highway and Transportation Officials (AASHTO) National Transportation Product Evaluation Program(NTPEP). Findings showed that performance of temporary pavement marking materials is highly dependent on the surface characteristics on which they are being placed, the amount of traffic traversing the material, and the marking material used. All tape products met the Iowa Department of Transportation (DOT) minimum retroreflectivity standard throughout the duration of the work zone. With a few exceptions, due to marking location, the tape products were removed easily with minimal to moderate discernible markings remaining. 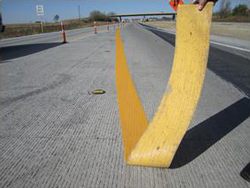 Based on these findings, the research team recommends that the Iowa DOT consider using temporary pavement marking tape products for all markings within the crossover section of the work zone, given this area receives the most wear from vehicle weaving actions and also presents the most challenges for maintaining the markings. The team also notes that removable paint products are rapidly evolving and are a potentially promising alternative in terms of installation, cost, and removal (no scaring), and are worth investigating further.